This spring, my mom found this adorable idea in a magazine – ribbon bedazzled wine bottles. It’s such a cute, personalized idea for a typical bottle of wine and a lot more festive than the bags they sell at Hallmark. 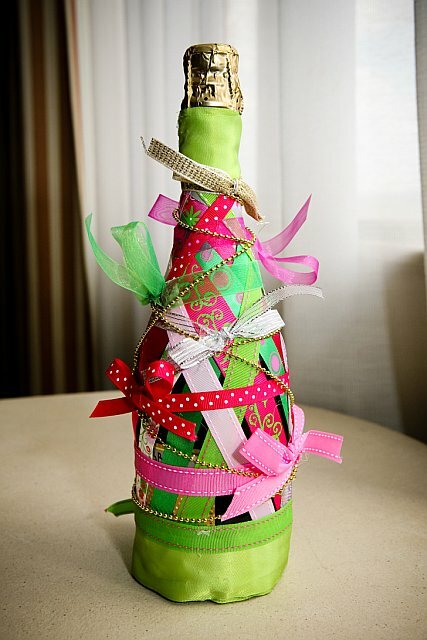 For my wedding this past June, my mom made bottles of champagne decked out in ribbons (above) with corresponding wedding colors for the bridesmaids and special attendees. 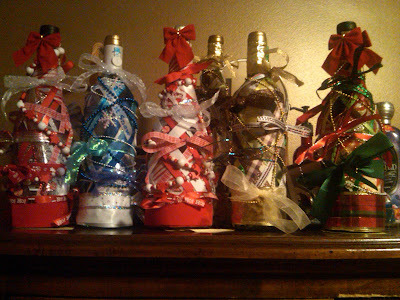 This holiday season, Sue is at it again with holiday bottles. These make awesome hostess gifts and a solution for those awkward moments when someone gets you a gift and you didn’t buy them anything! Here’s a sample of Sue’s holiday collection!